Carole Bayer Sager (born Carol Bayer on March 8, 1947) is an American lyricist, singer, songwriter, painter, and New York Times best-selling author. Bayer Sager was born in Manhattan to Anita Nathan Bayer and Eli Bayer. Her family was Jewish. She graduated from New York University, where she majored in English, dramatic arts, and speech. She had already written her first pop hit, "A Groovy Kind of Love", with Toni Wine, while still a student at New York City's High School of Music and Art. It was recorded by the British invasion band The Mindbenders, whose version was a worldwide hit, reaching number 2 on the Billboard Hot 100. This song was later recorded by Sonny & Cher, Petula Clark, and Phil Collins, the latter whose rendition for the film Buster reached number one in 1988. She also had a career as a singer, including her 1977 Australian number one single "You're Moving Out Today", which also reached number 6 in the UK singles chart in June 1977. 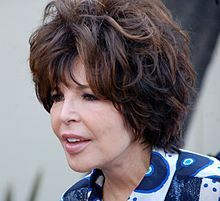 Bayer Sager's first recording as a singer was the 1977 album Carole Bayer Sager, which included "You're Moving Out Today", a song which she co-wrote with Bette Midler and Bruce Roberts. Paul Buckmaster provided horn and string arrangements for the album. The album went platinum in Japan, Australia, and the United Kingdom. It was followed by ...Too in 1978, and a third and last album, co-produced by Burt Bacharach, entitled Sometimes Late at Night (1981), which included the single "Stronger Than Before", later recorded by Dionne Warwick and Chaka Khan. Bayer Sager had many hits during the 1970s. With Marvin Hamlisch and Neil Simon, she wrote the lyrics for the stage musical They're Playing Our Song, which was loosely based on her relationship with Hamlisch. The musical ran for over three years on Broadway. Many of Bayer Sager's 1980s songs were co-written with her former husband, the composer Burt Bacharach. She executive-produced the eponymous solo album for June Pointer, of The Pointer Sisters, in 1989. Bayer Sager has won an Academy Award (out of six nominations), a Grammy Award (out of nine nominations), and two Golden Globe Awards (out of seven nominations). She was inducted into the Songwriters Hall of Fame in 1987. Bayer Sager won the Academy Award for Best Original Song in 1982 for "Arthur's Theme (Best That You Can Do)", which was the theme song of the movie Arthur. Bayer Sager received the Grammy Award for Song of the Year in 1987 for the song "That's What Friends Are For", which she co-wrote with Bacharach. This song was originally written for the movie Night Shift (1982), and it was recorded for this movie by Rod Stewart. The song was popularized in a 1986 cover version by Dionne Warwick, Stevie Wonder, Gladys Knight, and Elton John. Her song with David Foster, "The Prayer", originally recorded by Celine Dion and Andrea Bocelli, won the Golden Globe, and is one of few songs to be sung at weddings and funerals alike. She was awarded a star on the Hollywood Walk of Fame and was inducted into the Songwriters Hall of Fame. Bayer Sager received the New York University Steinhardt Distinguished Alumni award in 2006. She is to receive the 2019 "Johnny Mercer Award" from the Songwriters Hall of Fame during their 50th anniversary induction ceremony. Along with Bruce Roberts and Kenneth "Babyface" Edmonds, Bayer Sager helped write the song, "Stronger Together", sung by Jessica Sanchez. The song was played after Hillary Clinton's speech at the 2016 Democratic National Convention. The song's title is named after the slogan that the Clinton campaign used as a show of uniting behind the Democratic nominee. The song was well received, and was praised by celebrities like Jennifer Lopez and Kim Kardashian. In 2018, she co-wrote the song "Living In The Moment" for the film Book Club, recorded by Katherine McPhee, as well as two songs on Barbra Streisand's album Walls: "Better Angels" and "What's On My Mind". She contributed lyrics to "GhostTown" on Kanye West's album Ye. Bayer Sager also paints. Her first solo art show was in March 2011 at the L.A. Arthouse in Los Angeles. Her second show ran for two months at the William Turner Gallery in Bergamot Station, Los Angeles, in 2012. Her third show, New Works, ran from September to November at William Turner Gallery in Los Angeles. Bayer Sager has served for the last seven years as a trustee of the Los Angeles County Museum of Art. She serves on the advisory board of DonorsChoose, which she and her husband Bob Daly brought to Los Angeles. She created a series of public service announcements to promote the organization, with animations voiced by Bette Midler, Claire Danes, Sidney Poitier, and Morgan Freeman. She married record-producer Andrew Sager in 1970, and they divorced in 1978. Bayer Sager was involved in a romantic relationship with composer Marvin Hamlisch in the late 1970s. On April 3, 1982, she married composer and pianist Burt Bacharach after over a year's co-habitation: in December 1985 the couple adopted an infant son, whom they named Cristopher Elton Bacharach. Bacharach and Sager divorced in 1991. Since June 1996, Bayer Sager has been married to Robert Daly, former chairman of Warner Brothers and former chairman / CEO of the Los Angeles Dodgers baseball team, and currently chairman of the American Film Institute (AFI), Bayer Sager and her husband live in Los Angeles. In October 2016, Bayer Sager published her memoir They're Playing Our Song: A Memoir (Simon & Schuster). She also narrated the audiobook version. ^ "Deaths: Bayer, Anita Nathan". The New York Times. March 5, 2008. ^ Sager, Carole Bayer (2016). They're Playing Our Song: A Memoir. New York: Simon & Schuster. p. 2. ISBN 9781501153266. ^ "The 54th Academy Awards, 1982". Oscars. ^ "Carole Bayer Sager on creating the hit theme from "Arthur"". CBS News. October 14, 2016. ^ "Carole Bayer Sager to Receive Johnny Mercer Award at Songwriters Hall of Fame". Variety. 2019-03-06. Retrieved 2019-03-06. ^ "Hillary Clinton taps American Idol's Jessica Sanchez for anthem "Stronger Together"". Teen Vogue. 2016-08-01. Retrieved 2016-08-19. ^ "Jennifer Lopez on Twitter: "â?¤ď¸? the message in @JessicaESanchez new unity anthem "Stronger Together" 4 @HillaryClinton & the #DNC #ImWithHer "". Twitter. 2016-07-27. Retrieved 2016-08-19. ^ "Kim Kardashian West on Twitter: "This is such a powerful, positive message! We are "Stronger Together." @CaroleBSager #DNC "". Twitter. 2016-07-27. Retrieved 2016-08-19. ^ a b Terry, Clifford (October 20, 1985). "Singer-songwriter Carole Bayer Sager makes career change". Chicago Tribune. ^ a b "About Carole Bayer Sager". CaroleBayerSager.com. Archived from the original on February 14, 2012. Retrieved March 11, 2012. ^ Heller Anderson, Susan (July 13, 1991). "Chronicle: Discord in the pop-music world". The New York Times. ^ "Weddings of the Year: Carole Bayer Sager & Robert Daly (June 8, 1996)". People. February 10, 1997. ^ "Carole Bayer Sager on her new memoir: They're Playing Our Song, a New York Times Best Seller". cbsnews.com. Retrieved October 17, 2016.